We have taken good advantage of the recent hot dry spell (as I type this there is a little rain falling - but we finished stacking the hay 4 hours ago!) 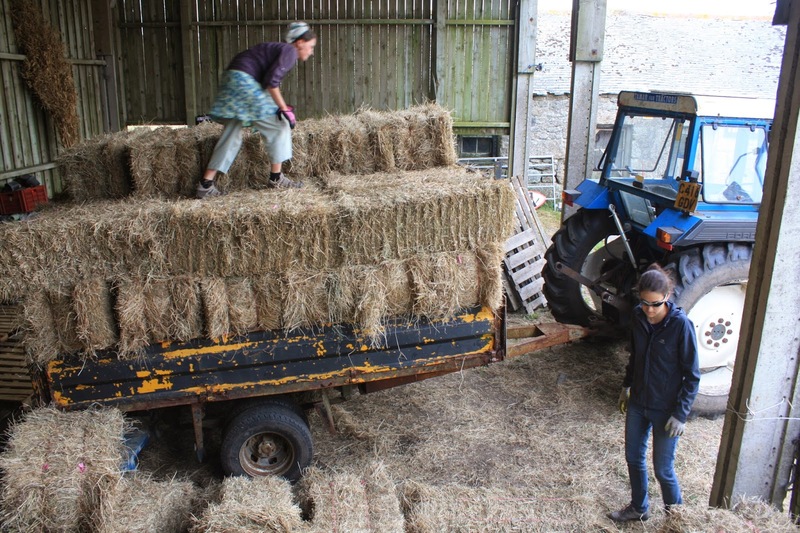 and cut two fields for hay, making 623 small bales, and we have just spent the weekend collecting them and stacking them in the open barn. 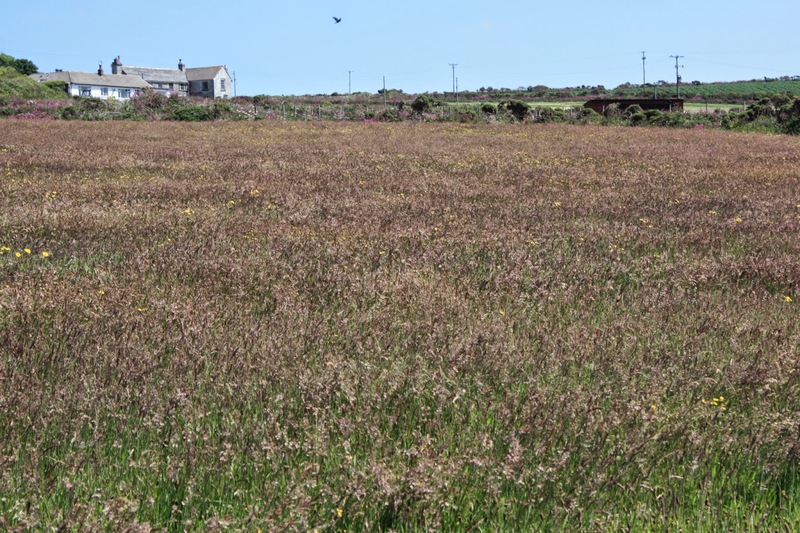 Four-Acre Field ready for cutting. 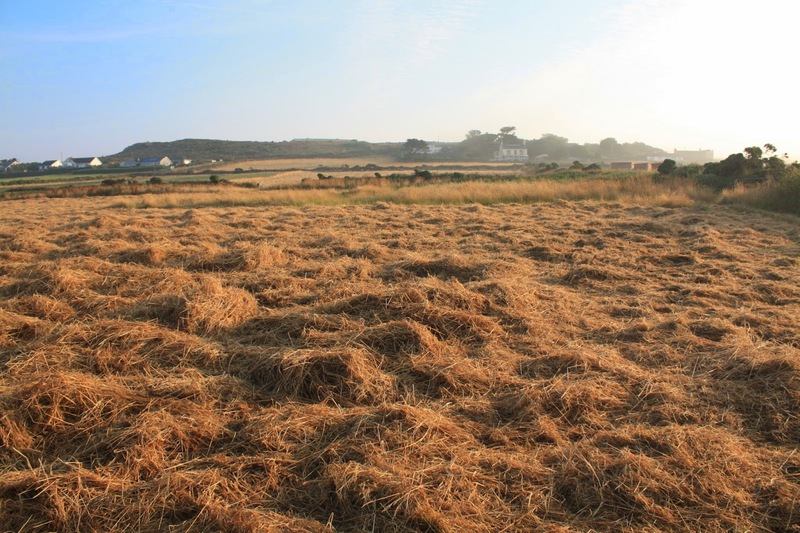 Hay drying on Home Field. 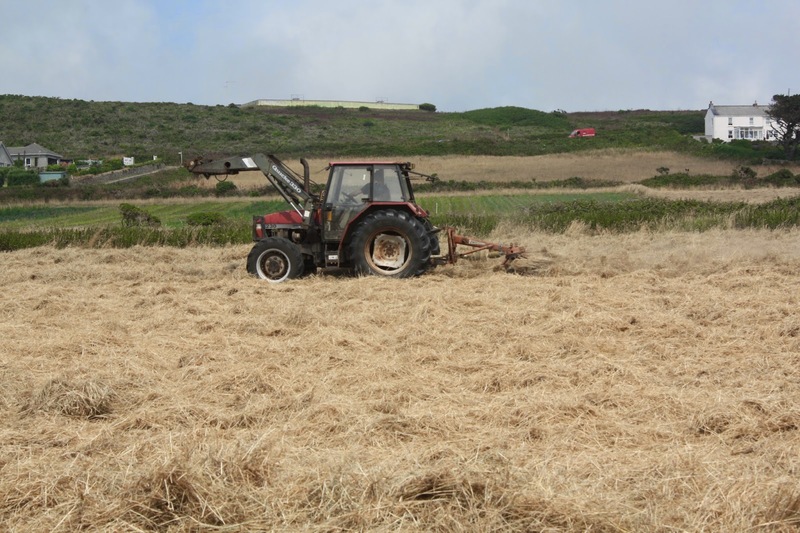 Turning the hay on Home Field. 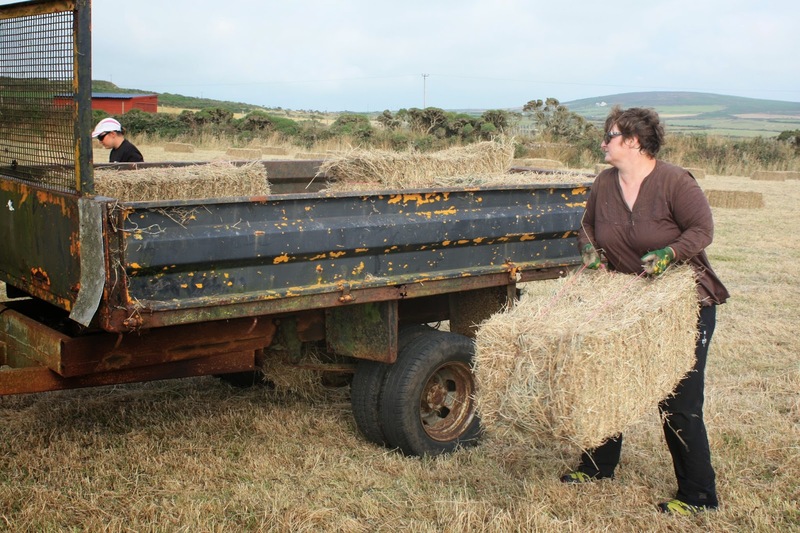 Sigrid loading hay into the trailer. Lucille and Lucie loading hay. 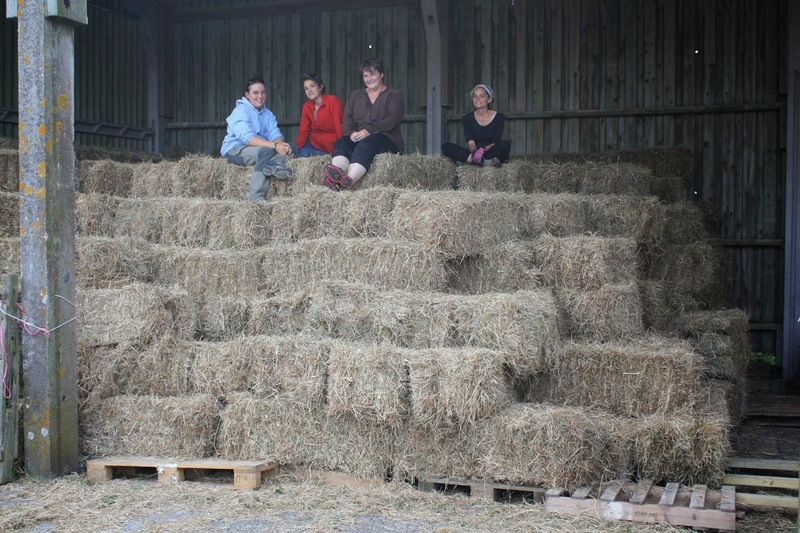 Many thanks to Lucie, Lucille, Lauranne, Sigrid and Alice for bringing in the hay and stacking it, and also to Morgan and colleague for cutting, turning and baling it. 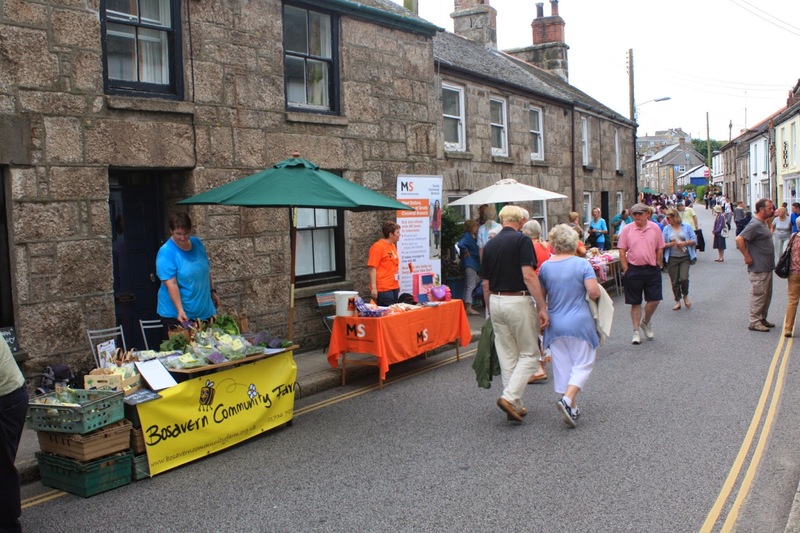 St Just Produce and Craft Market is held on the second and fourth Saturdays of each month, from 09:30 till 12:30, in the Royal British Legion in St Just, very close to the big free car park in the centre of town. 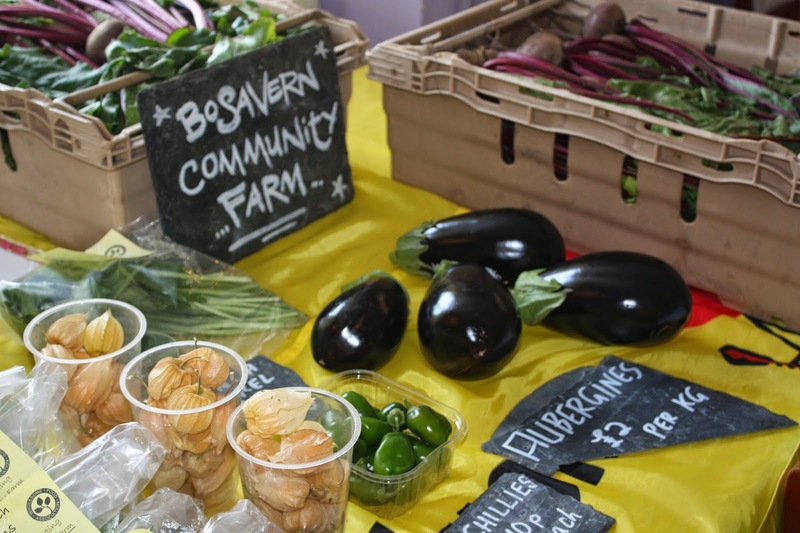 As well as our stall selling fresh farm produce there are stalls with cakes, pasties, savouries, bread, fudge, eggs, preserves, pork, fish, and a cafe area. 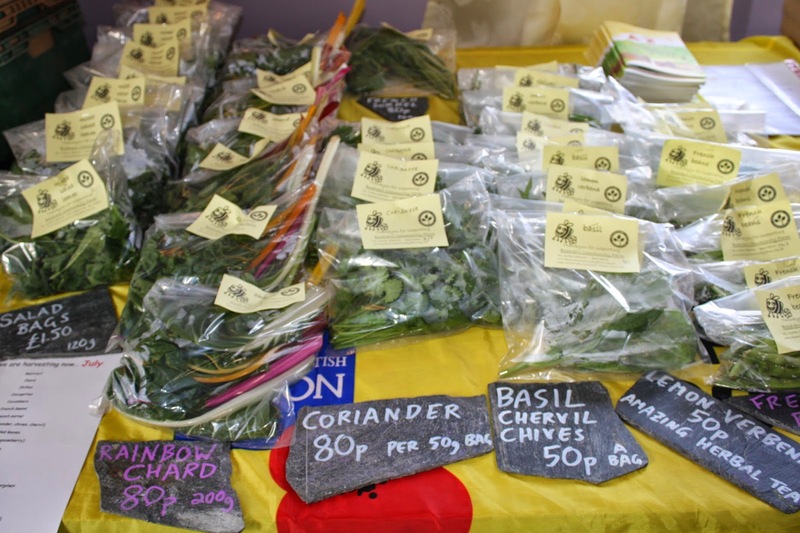 Please come along and support local producers at your local market! 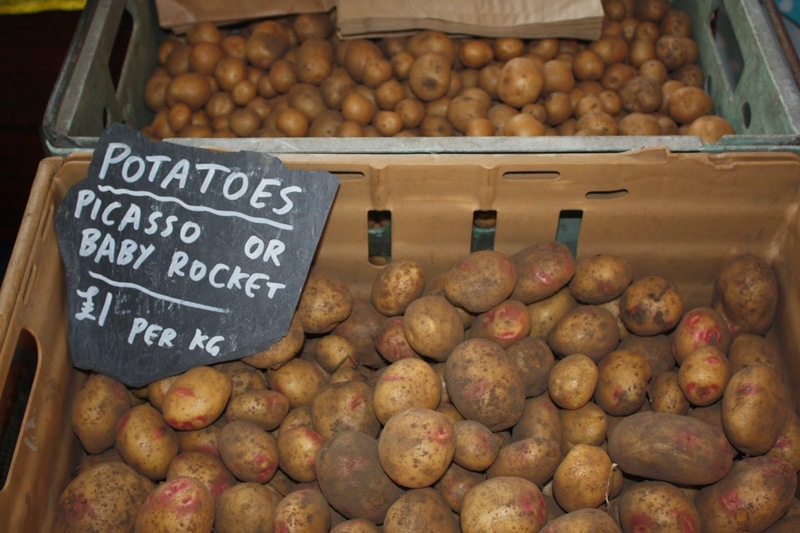 Now that the "hungry gap" is truly behind us, we have re-opened the farm shop in the packing shed off the farmyard. We will be open from Wednesdays to Sundays inclusive, from 11am till 6pm (and the honesty box gate-stall will be closed during these times, but open from dawn till dusk at all other times). Please park in the farmyard. 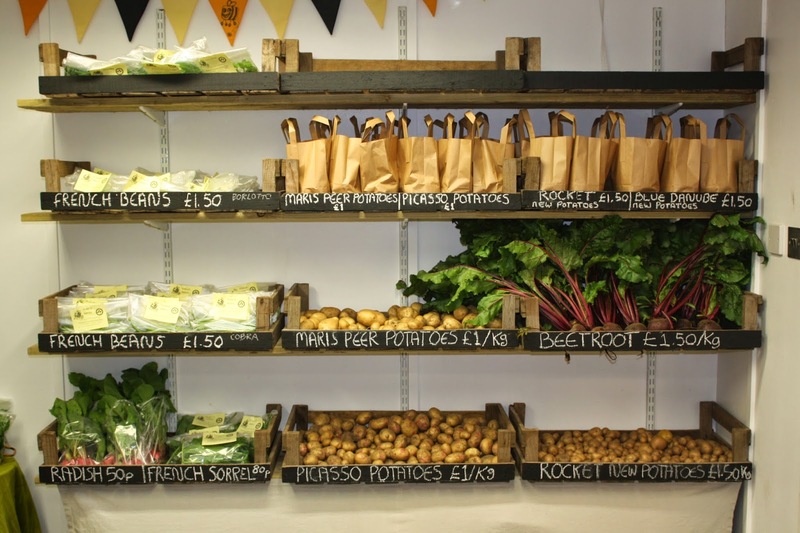 As well as our own fresh farm produce, we offer a range of local jams, sauces, chutneys, honey, herbal products and leather-work. We are also looking for new volunteers to help in the shop, so if you are willing to spend a few hours a week please get in touch with us on 788454 (thank you!). 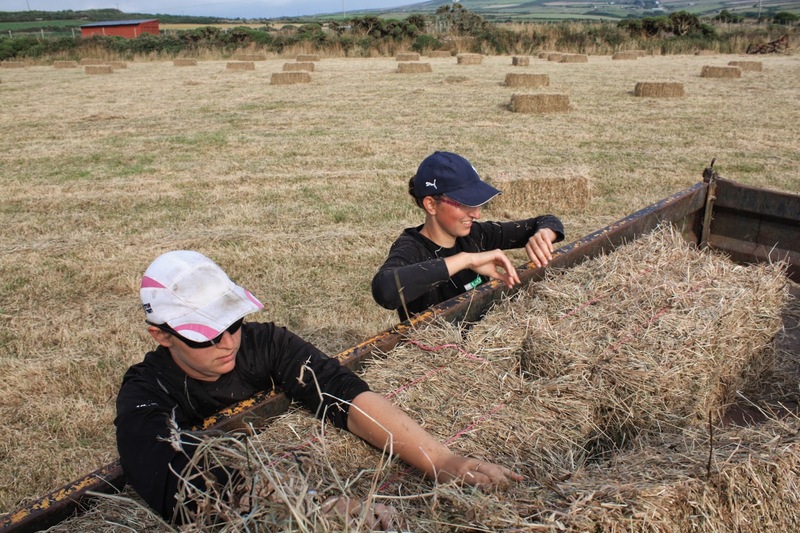 Andreas, from Seattle, left us yesterday after one week volunteering on the farm - many thanks for all your help and enjoy the rest of your time in Cornwall. and 1kg of beetroot with the leaves on. 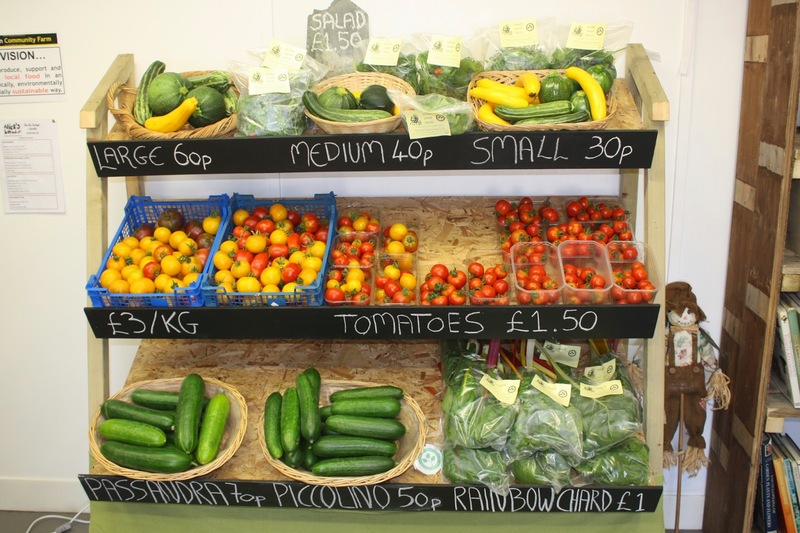 Anybody wanting support the community farm by joining our veg box scheme please contact us on 01736 788454, or email vegbox.bcf@bcents.org. 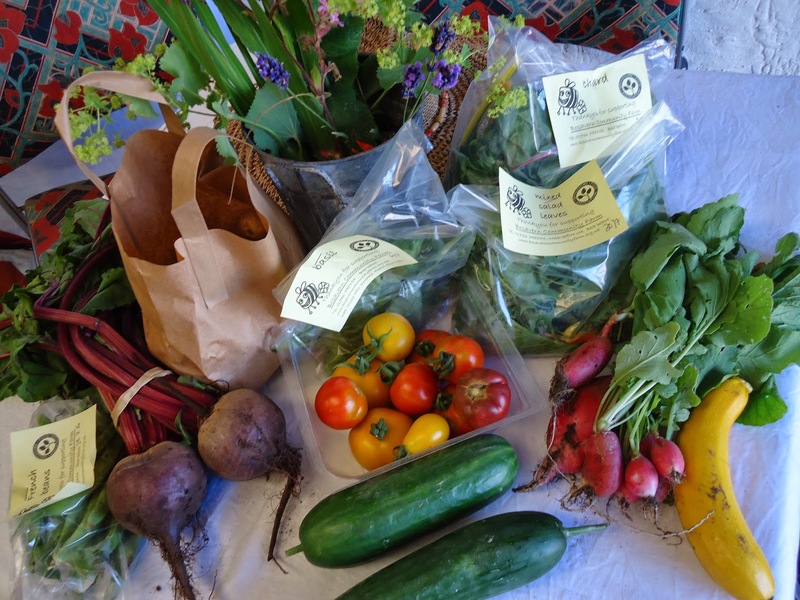 Boxes are ready on Friday afternoons, and can be collected from the farm, The Apple Tree Cafe near Sennen, the North Inn in Pendeen, the Red Wing Gallery in Penzance, or St Just farmer's market. The two-week arts festival that is Lafrowda finished yesterday, with a wonderful day of processions, music, community and festivities. Bosavern Community Farm would like to thank all the Lafrowda crew for making this excellent event happen year after year. 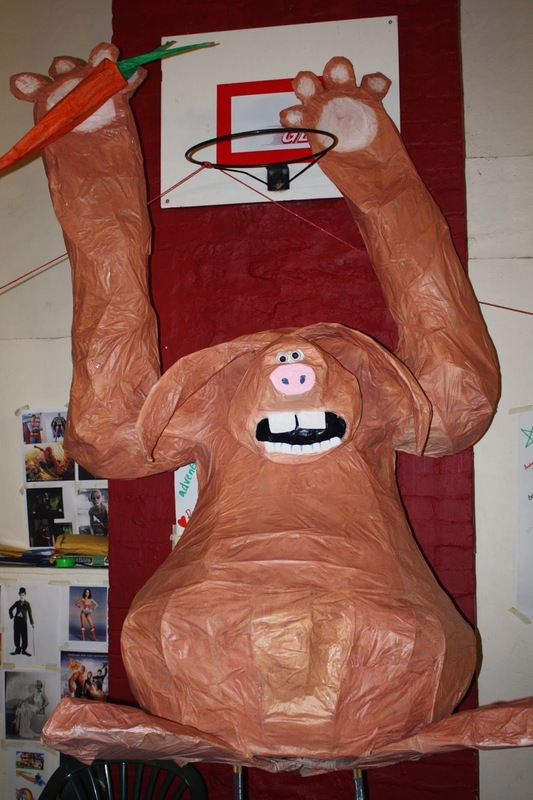 For the fourth year running we had a stall on Fore Street selling farm produce and promoting the farm and its veg box scheme, and for the second year running we had a willow sculpture in the community parade. 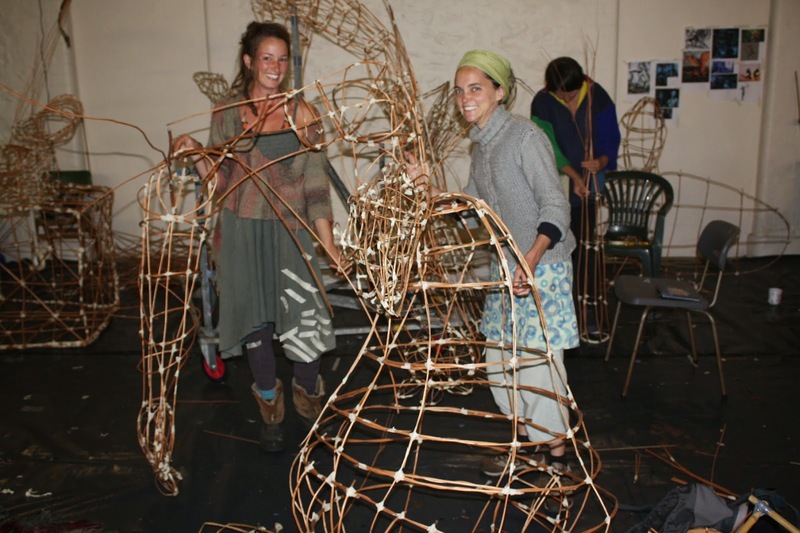 Nikki and Alice getting started on the "were-rabbit". 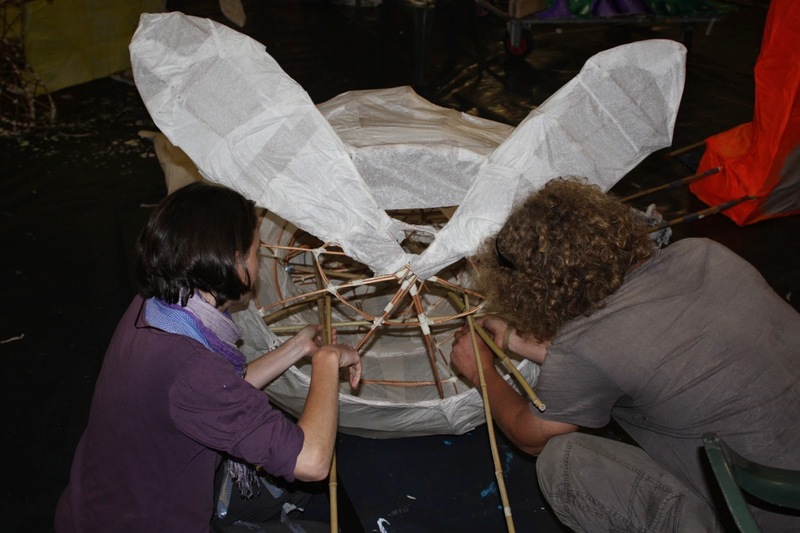 Alice and Pete working on the "were-rabbit". 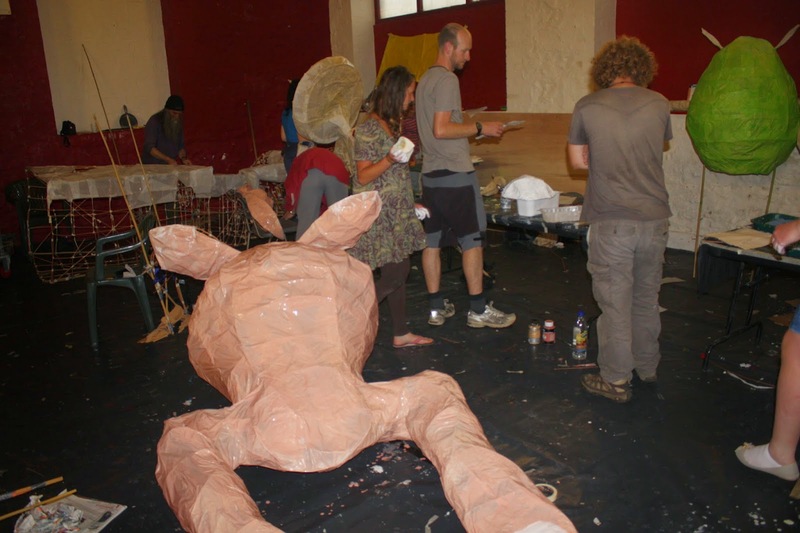 Our completed "were-rabbit" ready to parade through town. Sigrid working on our stall on Fore Street. 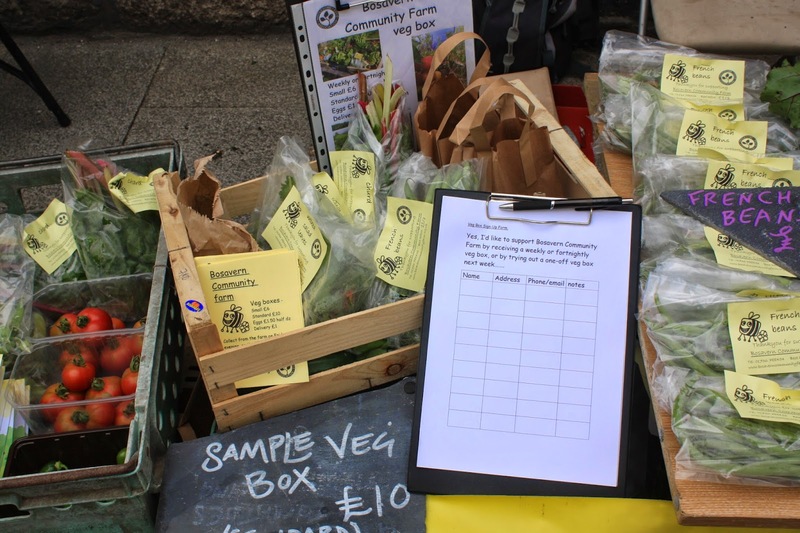 Promoting our veg box scheme on the street stall. We'd like to thank Nikki and Alice for taking the lead on our amazing were-rabbit, all the other people who helped them, everyone who helped on the stall on the day, all the people who supported us by buying produce, and Tim for running a stall at Pendeen Farmer's Market simultaneously. P.S. If anyone has a good photo of the were-rabbit in the procession can they please email to us for posting on this blog - many thanks. Hugh carrying the were-rabbit in the community procession. Thanks to Kate for the photo! 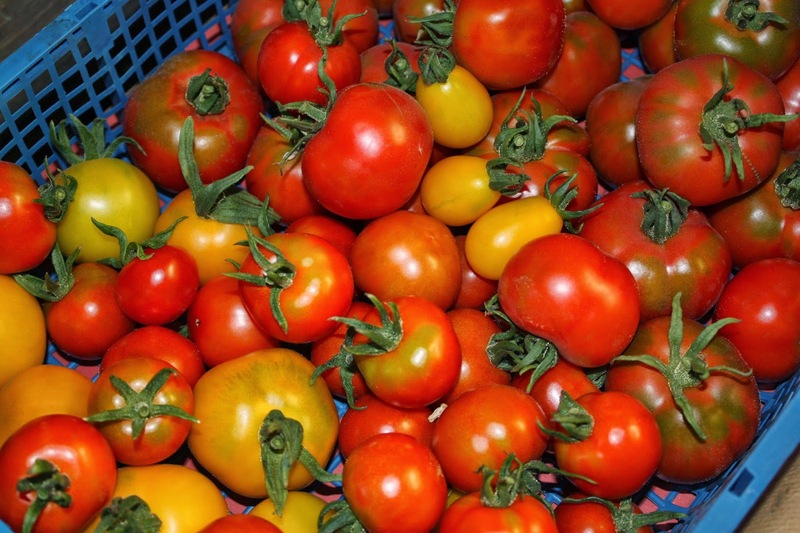 We picked our first tomatoes of 2014 10 days ago - 6 weeks earlier than last year. 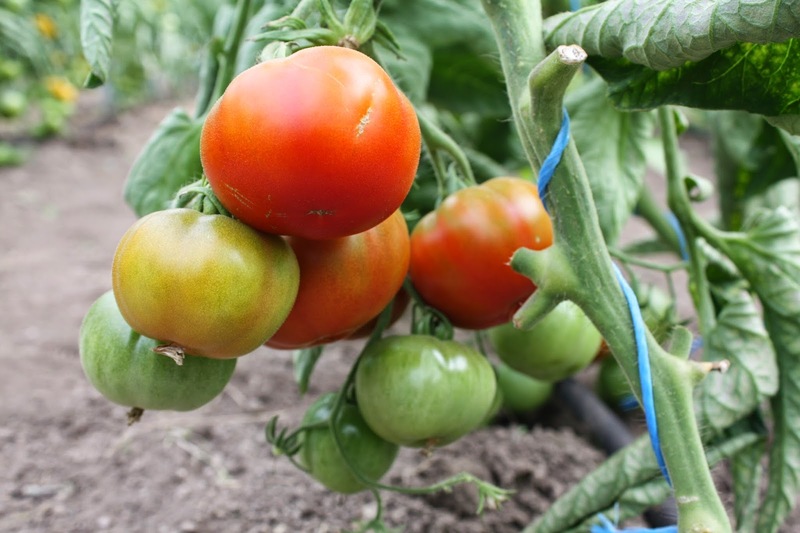 This year we are trialling a few new varieties to see how they perform, and all are looking good so far, as well as our tried and tested favourites. 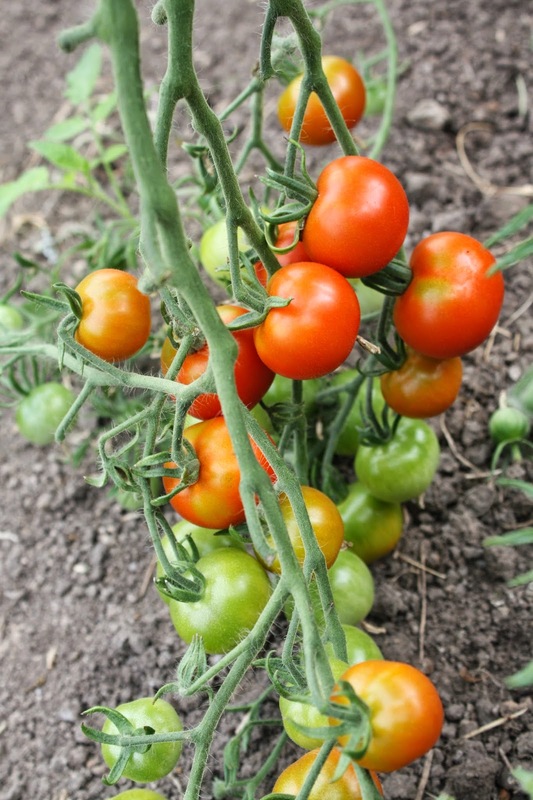 There will be tomatoes in the veg boxes for the first time this coming Friday. 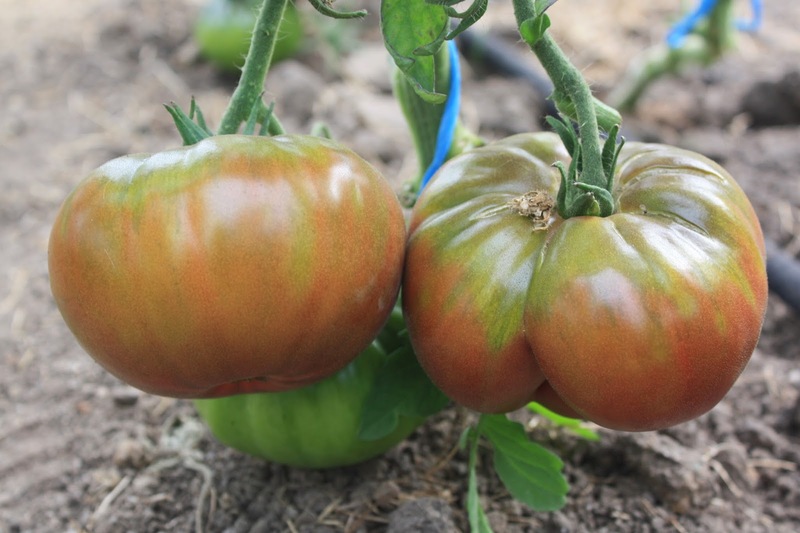 "Black Russian" tomatoes, more of a maroon really, we've already picked one that weighed half a kilo. "Gardener's Delight", one of our old favourites. 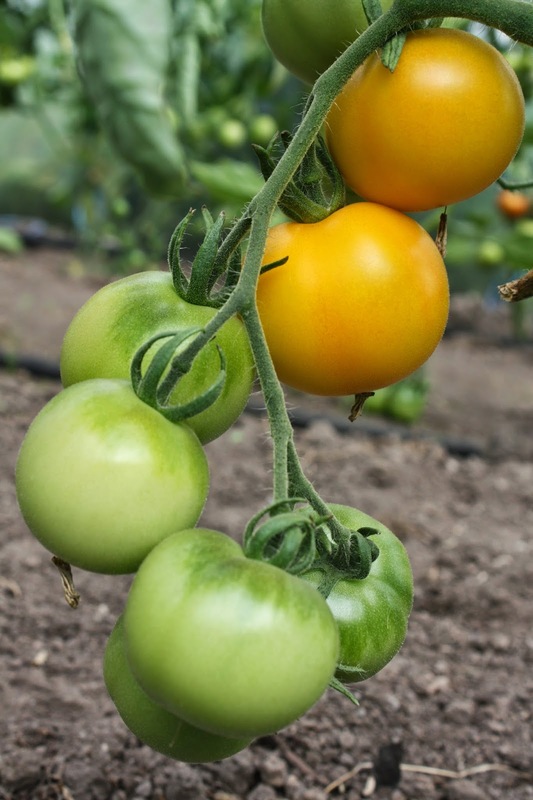 "Stupice", the first tomato to be ready this year, by a few days. 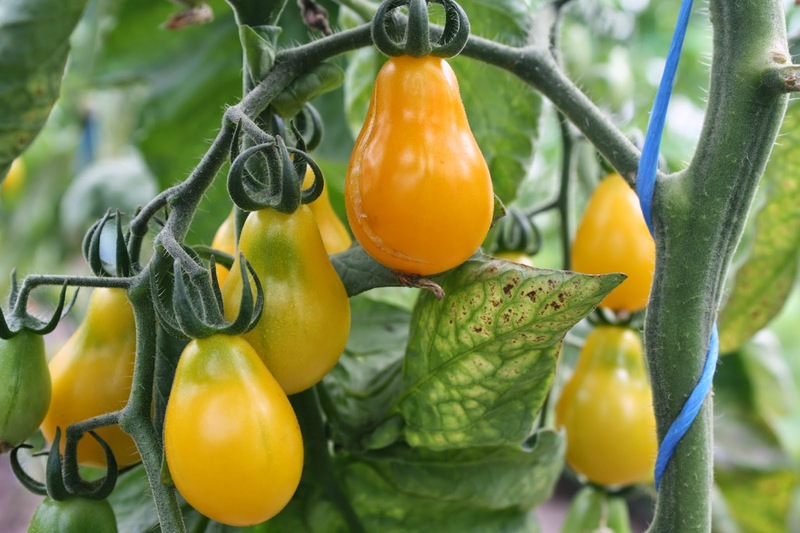 "Yellow Submarine" tomatoes, our new favourite! The first harvest of tomatoes, a colourful medley. 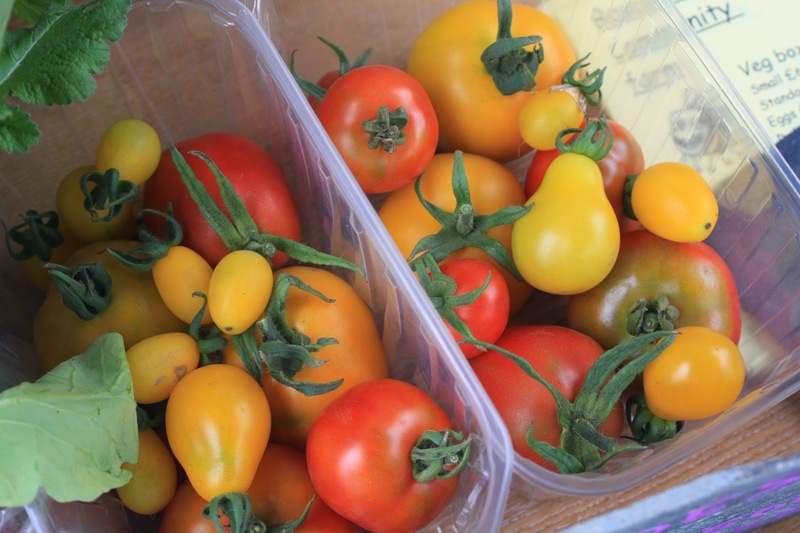 Two punnets for sale on our Lafrowda Day street stall. 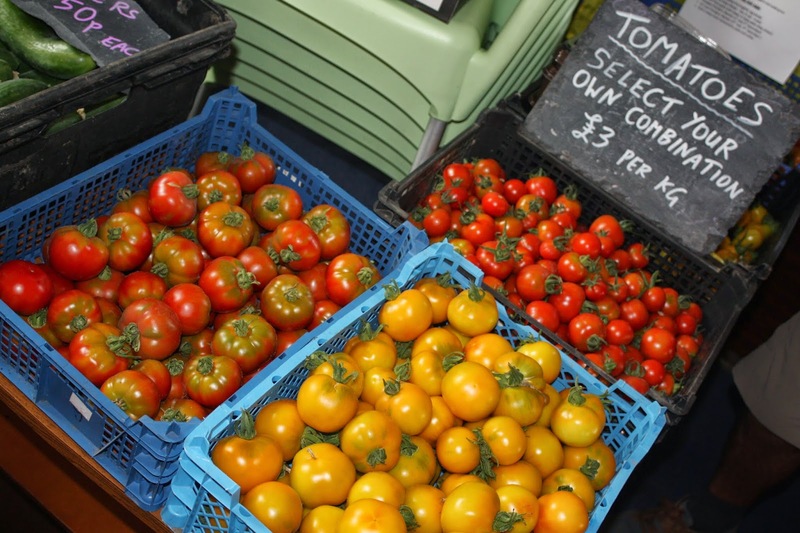 Our tomatoes are already on sale in the gate stall, at £1.50 for a half-kilo punnet. Many thanks to Max and Manuela, from Italy, for volunteering on the farm for ten days - we hope you are enjoying your road trip towards home. 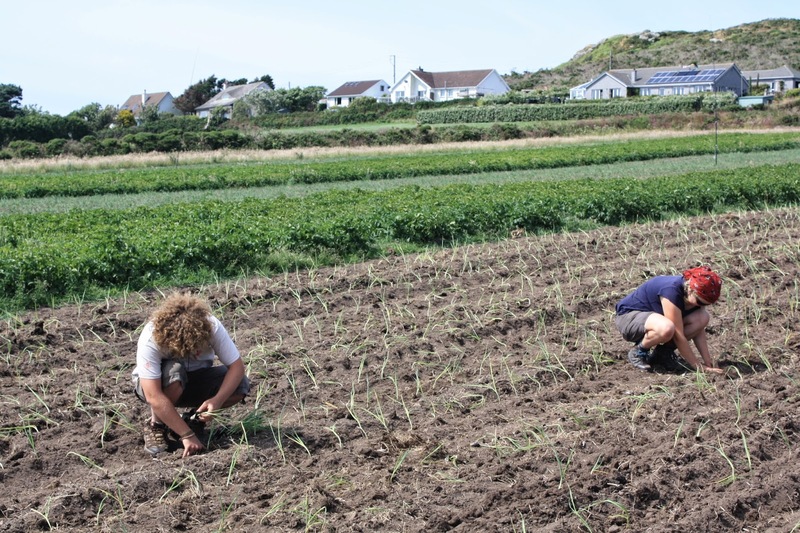 Max and Manuela (centre) as part of the onion-weeding task-force last week. Jessie, who wwoofed with us back in February, came back for two more weeks to help, and to see how we'd progressed in the interim - a lot! Thanks again, and hope to see you a third time. Jessie filling in the gaps whilst planting leeks. Also thanks to Camille, again from France, who also left this morning after 2 weeks volunteering on the farm - especially for helping with all those leeks whilst battling against swarms of horse flies! Camille with Eva on the back of the tractor ready to plant leeks. 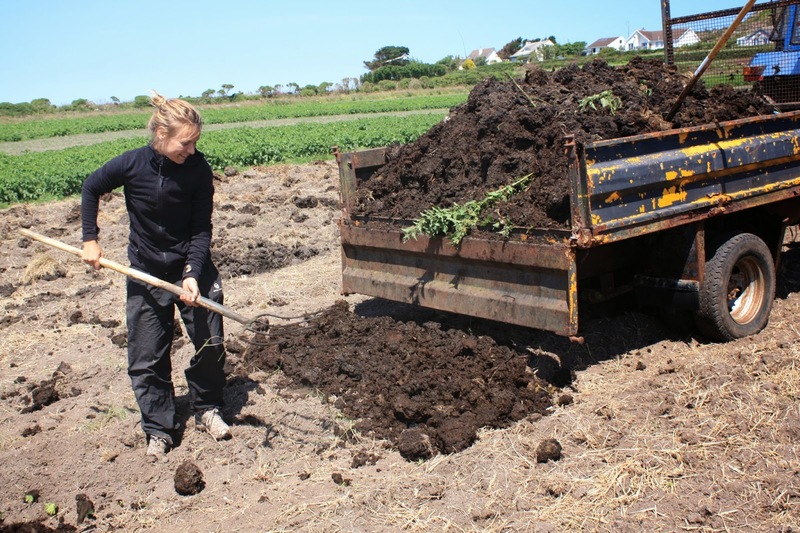 Many thanks to Eva, from France, who left this morning after 5 weeks as a wwoofer on the community farm - especially for all those hours shovelling manure, and checking rabbit and chicken fencing for holes! Eva having fun with another trailer-load of muck. 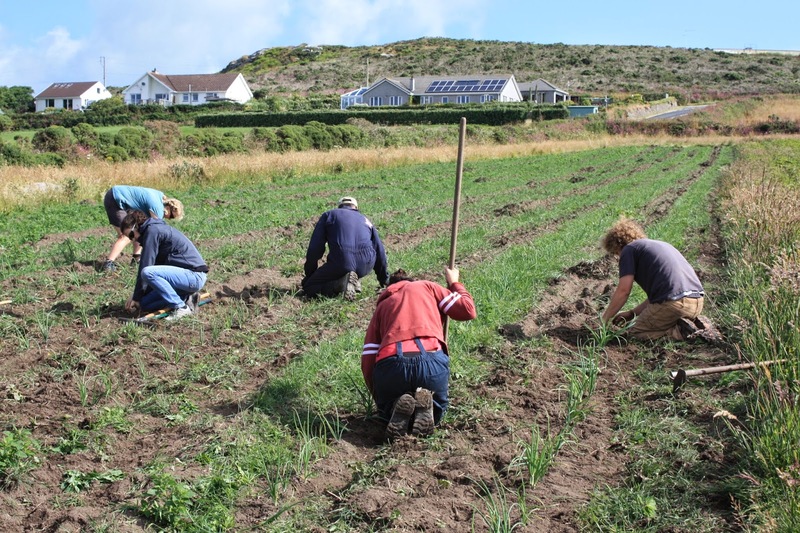 In 2013 we planted 5,000 leeks by hand in the market garden. 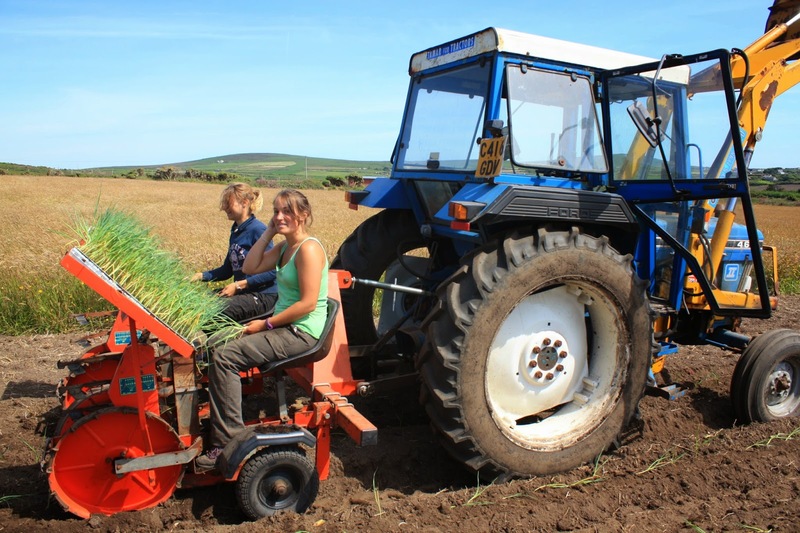 In 2014 we have just planted 15,000 leeks by tractor in our two maincrop fields. These should provide a succession of leeks from autumn to spring, of three varieties - Krypton (early-season), Pluston (mid-season) and Harston (late-season). 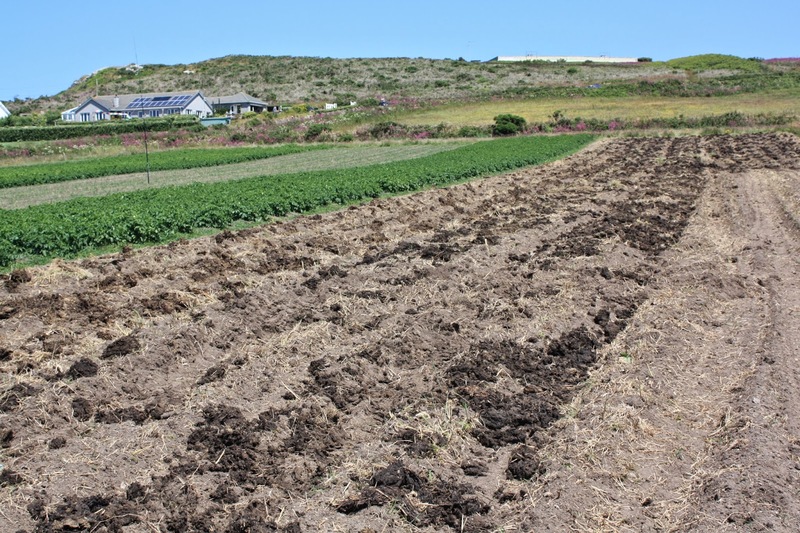 The planting took a small team of people one and a half days, but the ground preparation (including collecting and spreading 5 trailer-loads of manure) took a week. Spreading manure on the leek patch before rotovating it in. 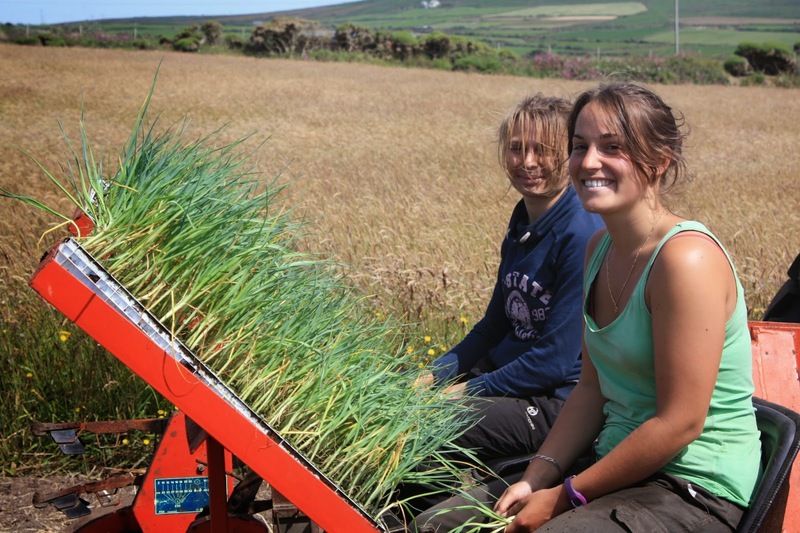 Eva and Camille on the leek planter. Jessie and Camille in action on the leek planter. Pete and Jessie filling in gaps after the planter. 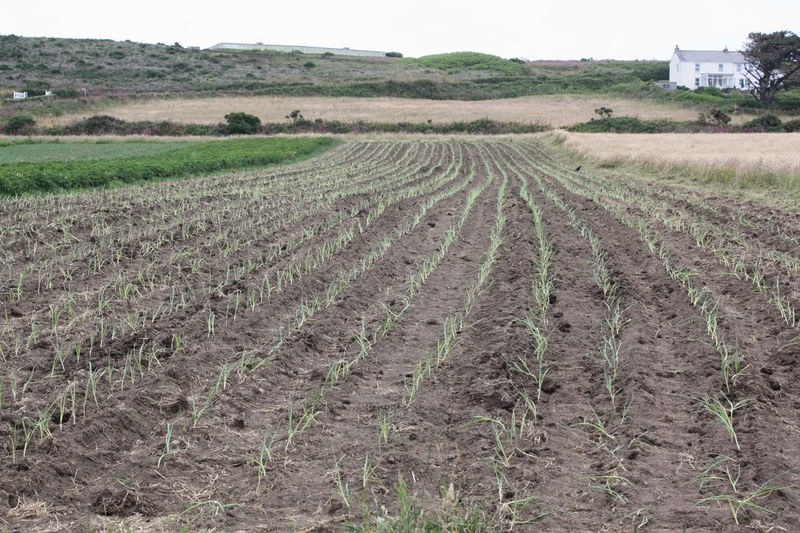 20 lines of leeks in the Four Acre Field. Of course, the planter is not perfect (though it is very fast! 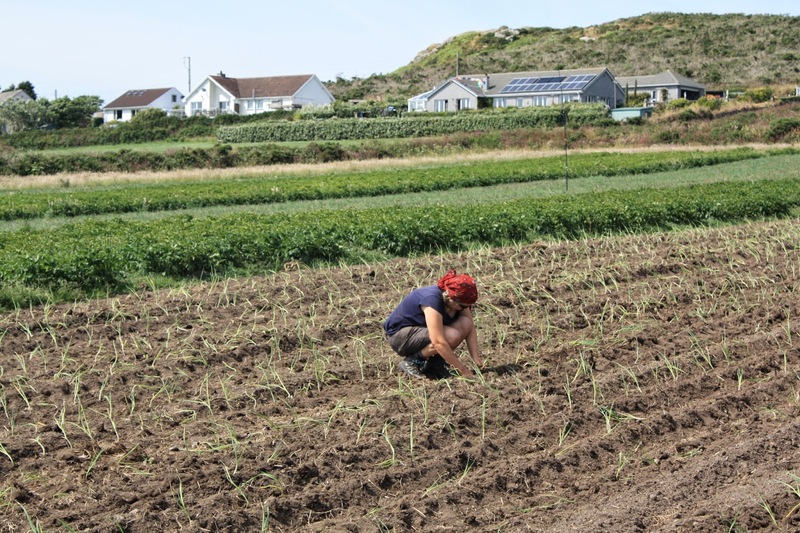 ), so walking the rows afterwards to push stray leeks into the ground, and to plug gaps where leeks are missing, is essential. 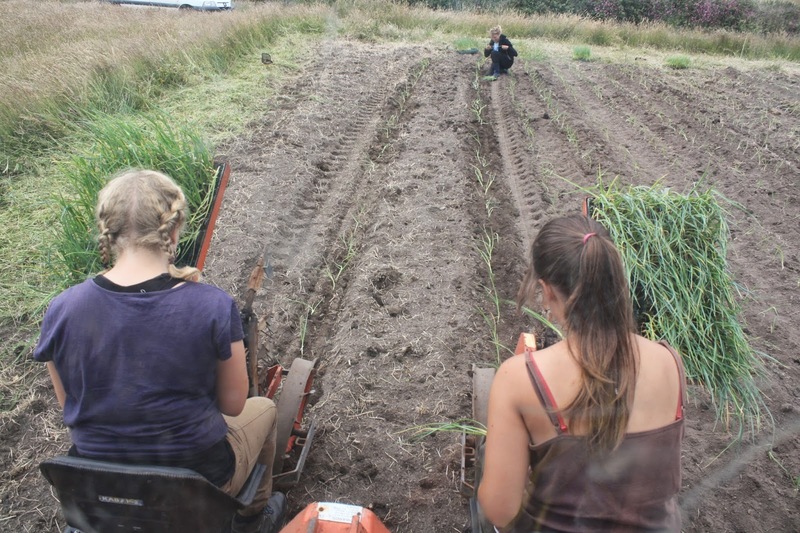 Still a lot faster than planting by hand though.... We placed the leeks at 20cm apart in lines 50cm apart. 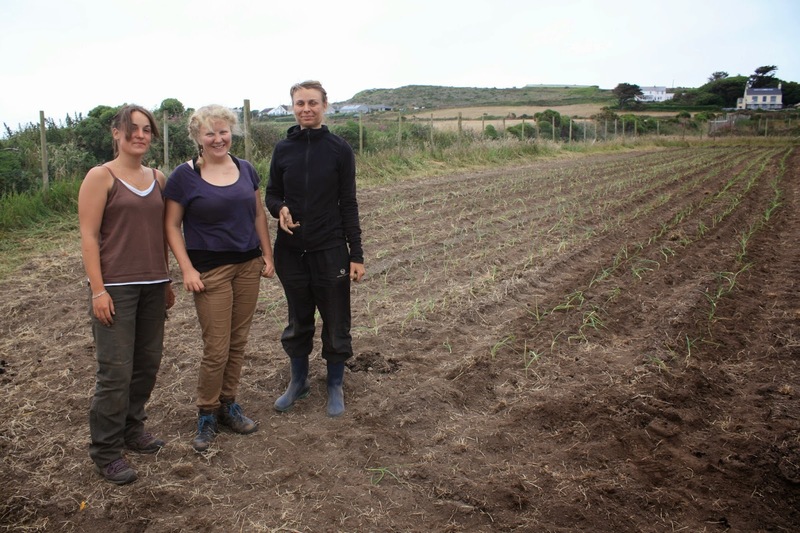 Many thanks to Pete, Nikki, Jessie, Eva and Camille for taking their turns on the planter and walking the lines, and also to Anne, Jenny and Willow for taking over veg picking and egg-collecting duties on Thursday so we could concentrate on leeks. Job done - Camille, Jessie and Eva next to the final 12 lines.